We have been running some scanned photos from “California of the Southland,” a book published by the UCLA alumni in 1937. Here we seen registration in 1936. 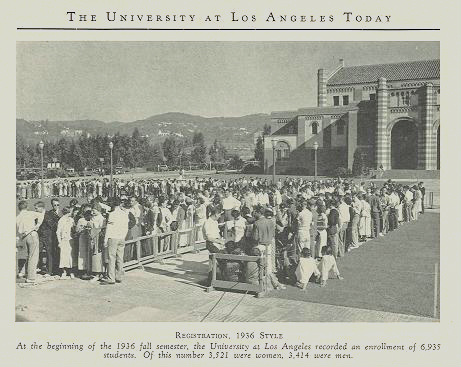 If you read the caption, you will note that women made up a slightly larger percent of enrollment back then. Item 6440-001-0001—University of California: Enrollment Funding. The Legislative Analyst, in consultation with the University of California, the California State University, and the Department of Finance, shall review the state’s current approach to enrollment funding, including a review of current funding per student and the marginal cost funding formula, and submit a report to the Legislature by January 1, 2014 with recommendations on how to fund enrollment going forward to promote access, quality, and other state higher education goals. There are other intentions for UC in the area of capital projects at Merced and San Diego (Scripps) which you can find on pages 27-28.